Cytochrome oxidase is the foundation of aerobic respiration. Our cells rip apart molecules of food, using the favorable energetics of the process to produce ATP. At the end of the process, however, the pieces need to be discarded. In particular, the electron transport chain saps the energy out of the electrons that are extracted from food molecules, and the cell needs a way to get rid of them. 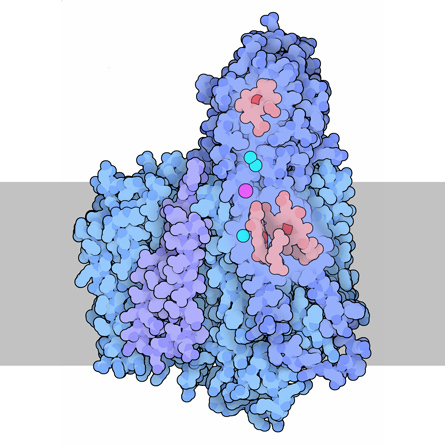 This is the job of cytochrome oxidase--it loads these electrons onto oxygen, creating water. In the process, it also pumps protons across a membrane, helping to create the electrochemical gradient that fuels ATP production. 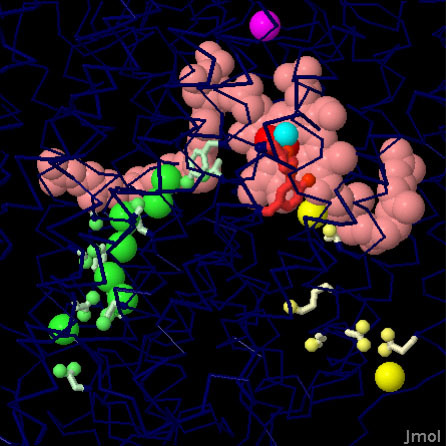 Cytochrome oxidase performs a tricky job: oxygen molecules are small and difficult to hold in one place. This job requires specialized chemical tools to make sure that everything goes as planned, which is particularly important for this reaction, since destructive intermediates may be formed if the process stops part way through. The active site of cytochrome oxidase relies on several unusual cofactors: two heme groups and a copper ion that grip the oxygen molecule, as well as an unusual pair of copper ions that guide the electrons to the reaction site. Looking at cytochrome oxidase from many organisms, we find commonalities and differences. The one shown here on the left is from mitochondria (PDB entry 1v54). It has the prototypical structure, with three core subunits, termed I, II and III, that perform the reaction, surrounded by a host of smaller subunits that tune its action. PSI researchers have recently solved the structure of an unusual variation on this theme, shown on the right (PDB entry 2yev). This cytochrome oxidase is made by the bacterium Thermus thermophilus. In it, the I and III subunits are fused into one long chain, and surprisingly, cytochrome c is fused to the II subunit. In most cases, cytochrome c is a separate, soluble protein that delivers electrons to cytochrome oxidase. In this bacterium, however, the cytochrome is fixed in place. There are more surprises in this structure as we look closer into the internal mechanisms. The coordinated action of creating water from oxygen and pumping protons requires two sources of protons: one for the reaction and one for the pumping. These are delivered via two separate pathways in the enzyme. Previous structures have identified a key glutamate amino acid that acts as the gate, controlling the flow of protons along one pathway of amino acids and water molecules that runs through the enzyme. The new structure, however, is missing this glutamate, and the gating is instead thought to be performed by a duo of tyrosine and serine. To take a closer look at these two proton pathways, the JSmol tab below displays an interactive JSmol. Lyons, J. A. et al. 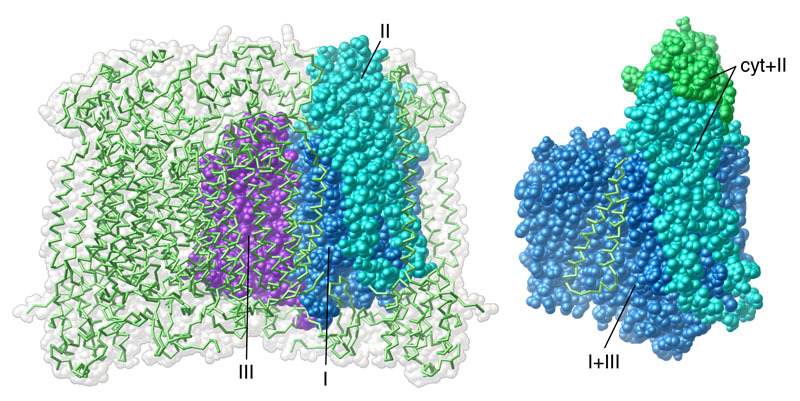 Structural insights into electron transfer in caa3-type cytochrome oxidase. Nature 487, 514-518 (2012). Pereira, M. M., Sousa, F. L., Verissimo, A. F. & Teixeira, M. Looking for the minimum common denominator in haem-copper oxygen reductases: towards a unified catalytic mechanism. Biochim. Biophys. Acta 1777, 929-934 (2008). Ferguson-Miller, S. & Babcock, G. T. Heme/copper terminal oxidases. Chem. Rev. 96, 2889-2907 (1996).